Not only does an ottoman make sitting in an easy chair even more comfortable than it already is, but there’s some evidence to suggest that straightening out your body by using an ottoman may actually be better for your health than just sitting regularly. We should probably start off with some of the beautiful bucket ottomans from around the web before I depress you with my own attempt. But part of living the bucket lifestyle is function before form, after all. Way before form, sometimes. 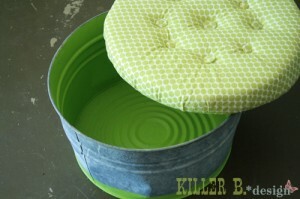 Our first bucket ottoman is based on an old metal washbasin. 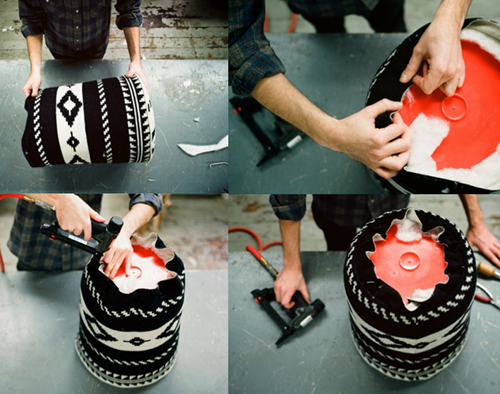 A full tutorial about how to create a similar work of art is on Killer B Designs. It’s clear that the designer has experience with professional upholstery jobs, and could probably sell these profitably on ebay. Our second guest from Design Sponge uses an actual 5 gallon plastic bucket – it has bright orange skin under its classy pattered facade. Finally, this is the disaster I’m responsible for. It only took 10 seconds to make and it can morph back to its bucket form at any time! It also doubles as a dicey coffee table. Update (2017): Don’t despair, we learned how to build a much nicer looking Ottoman. 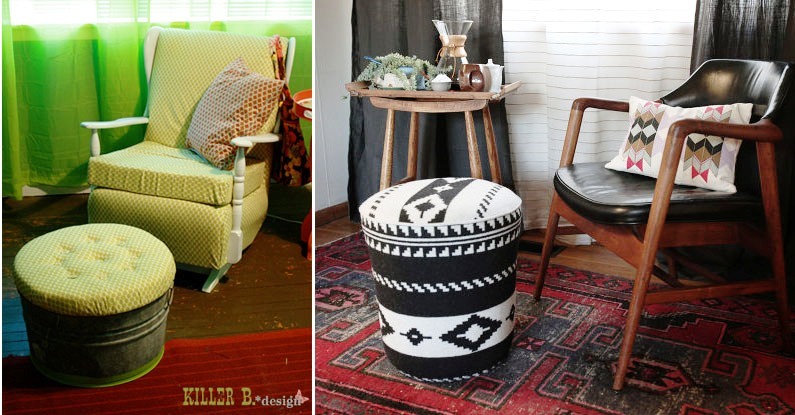 Learn how to build your own great looking Ottoman here! Thanks for the feature! 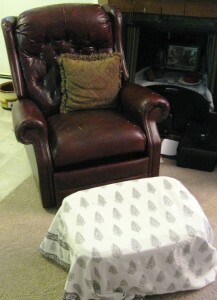 And this was actually one of my very first upholstery jobs. I’d never worked with buttons before, and pretty much experimented my way through it. Good luck on your future endeavors!